Sportauto Magazine is one of Germany’s biggest car magazines. 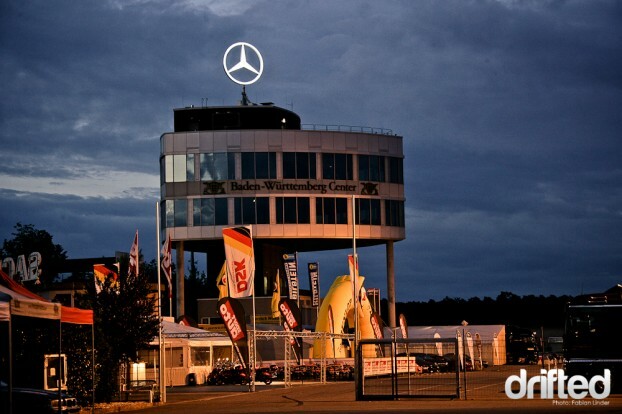 They’ve hosted the Driftchallenge since 2004, at the Hockenheimring. 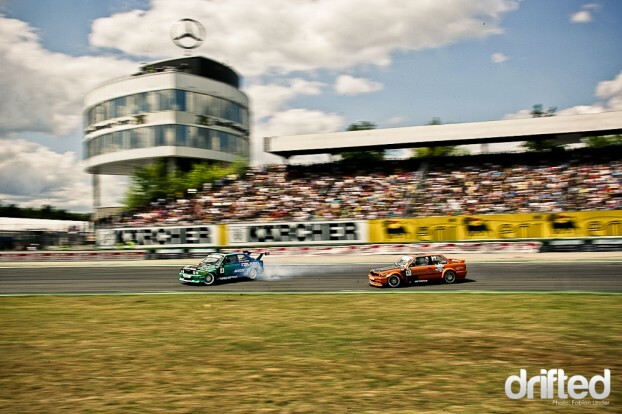 Since its beginnings, the Driftchallenge was the drift event with the most spectators in Germany and one of the most high profile. Like in the past, there was a training day and a competition day, so I got in my car on Friday and drove the 100 miles to the track. When I arrived, the training had already started, so I got my camera out and went for it. The Training on Friday is on a different track than the drift challenge. The training track is more difficult with several tricky corners. The competition course is a easy, high-speed 180° corner with a slight right corner afterwards, perfect track for twin battles. Before the Driftchallenge starts, there is the TunerGP. 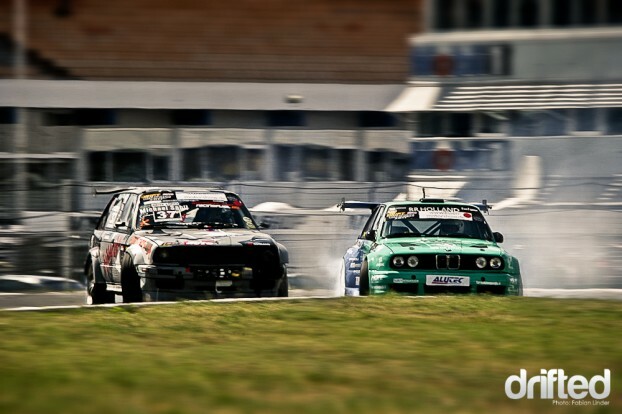 The best tuners of Germany compete in a big time attack race. 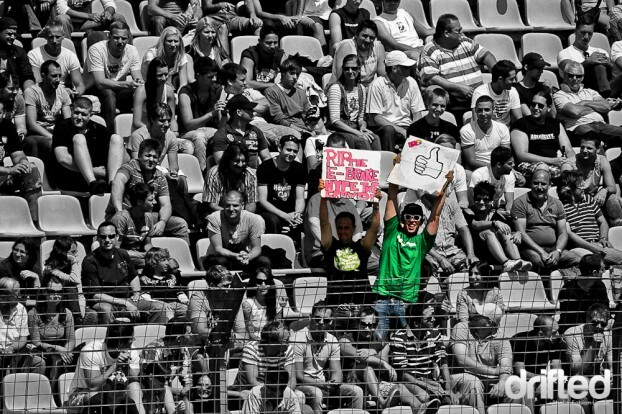 Due to the fact that the time attack race was very thrilling, the crowd was already hyped and couldn’t wait for the drift action to begin. 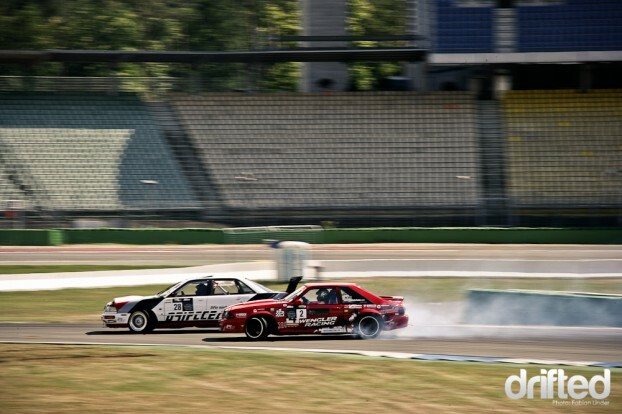 The sportauto hired two of the best judges I can think of: Axel Mack, a German drifter and Team Rowdy member, and Zdenek Wertheim, the Czech drift champion. 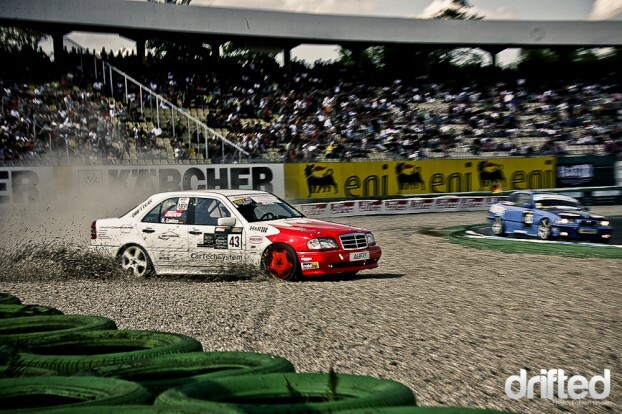 Patrick Ritzmann is one of Germany´s most talented drivers. He built up a E46 powered by a 2JZ. This nice S14 was build by a friend of mine, he calls himself the “Zahnfee (eng: tooth fairy)”. Quite a strange nickname, don´t know the history of it. I’m a big fan of this guy: Oliver Scheurich, he is successfully driving a street legal and daily driven M5. The swiss driver Florian Zimmermann wanted something different, so he built up a Audi with a supercharged V8. 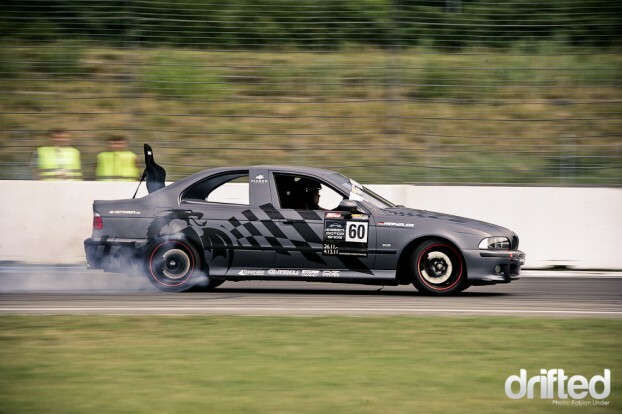 The owner of this car, Martin Reinsch had a nice street legal S14 which he crashed a year ago in the czech republic. 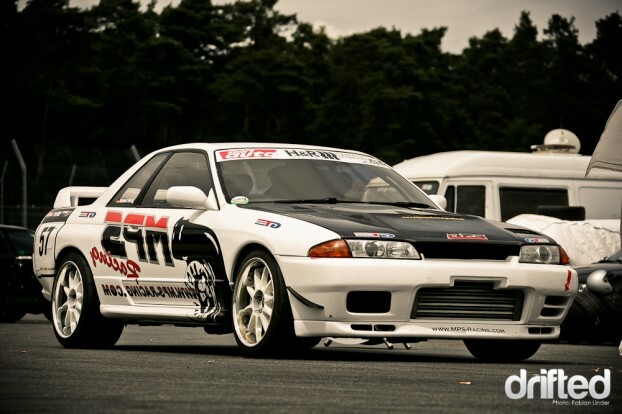 Now he´s back with another properly built S14. A pickup conversion on this M5. What’s interesting is the additional seat on the back. I have never seen anyone riding in it! 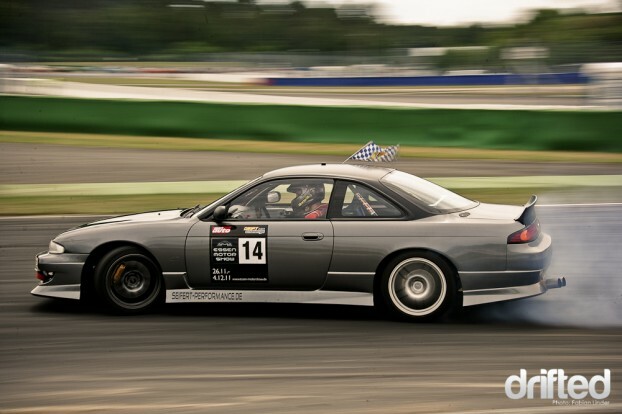 One of my favorites: This S13 from austria is powered by a RB26 and has a really nice rocket bunny body kit on it. In the training the E46 2JZ was going well, in the competition he barely moved. I really feel sorry for Patrick. 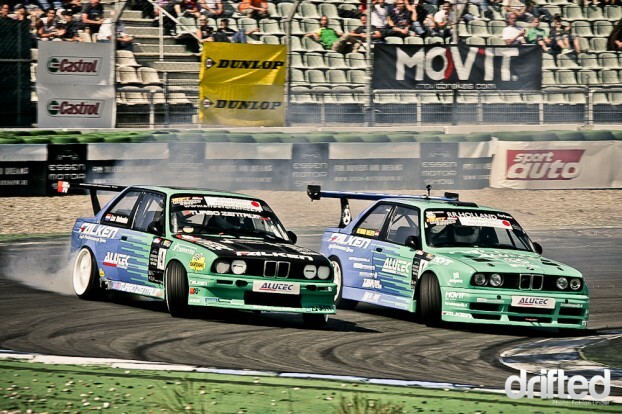 Another nice E46: Juri Bianchi from Switzerland – in the Top8 battles he spun. 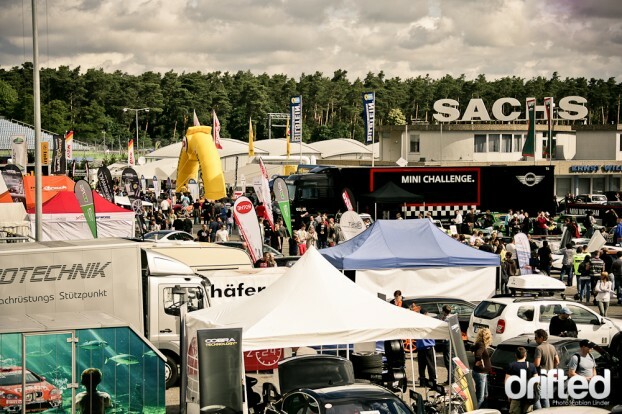 Thousands of visitors came to see the TunerGP and the Driftchallenge. Many Tuning and Tire company’s showed up with their booths. 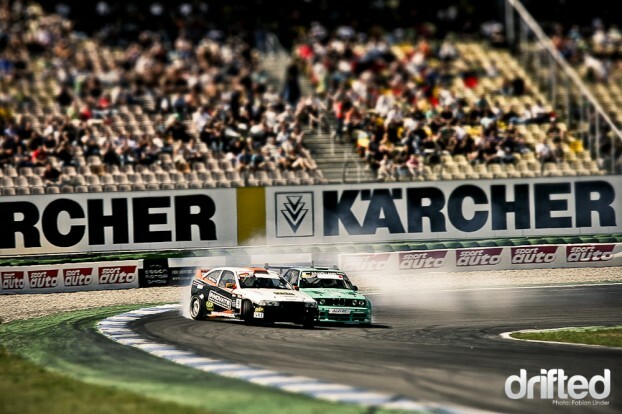 The only drift event in germany where the big tribunes are filled with people, great atmosphere! 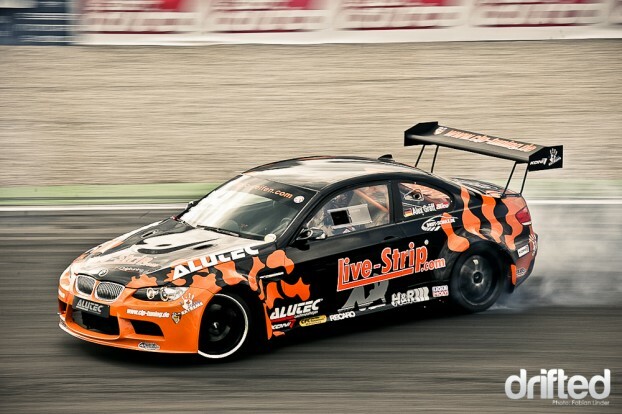 Alexander Gräff presented his new competition car: A BMW M3 with a GT 2 look body. 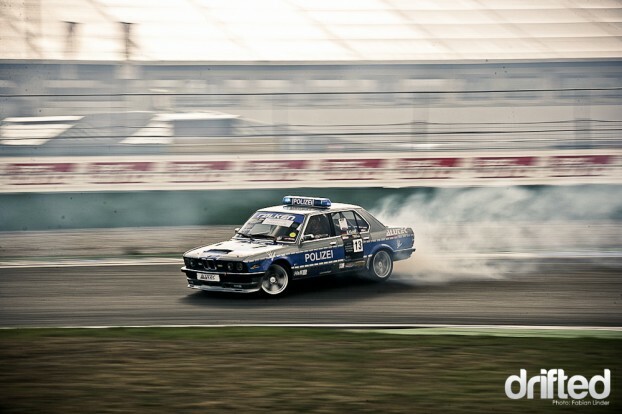 He had also his old car in Hockenheim, the police BMW E28 with M5 engine. Swen Burkhard had a big accident at the night after this race. On the autobahn a VW hit his trailer at about 160km/h. Luckily no one got hurt and the supercharged AE86 is already back alive. 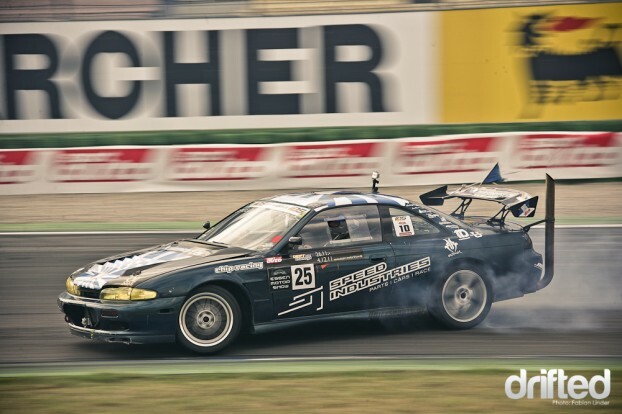 Since this year Nissan Germany has its own drift team; Harry Müller in his widebody S15 called “Batman”, and Michael Scherr in a 300ZX called “Hulk”. The “Hulk” 300ZX is already well known in Germany, due to several appearances on television. 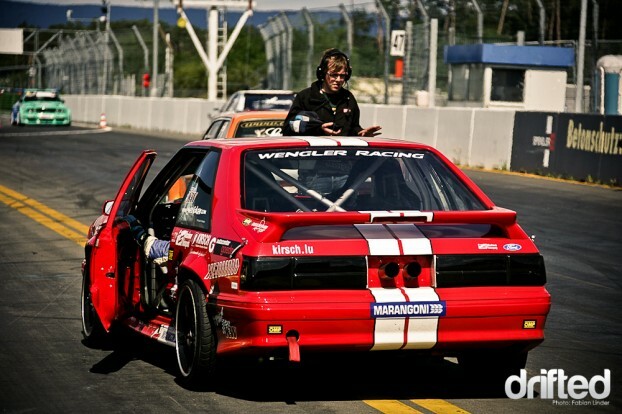 Yves Faber in his Wengler Racing Mustang waiting for the start. Top 16 Battles: Yves Faber chases Florian Zimmermann, Florian reached the sixth place. Already in the Top-Eight Battles Swiss driver Michu Sahli had to compete against Remmo Niezen. He did well, but Michu had no chance against the “Master” Remmmo, Michu ended up in the third place. Tim did a great job but Remmo as chaser was just too fast. He needed to take the grass in order to prevent a crash. When Remmo is leading, most of the chasers have no chance. Congratulations! There was a teamdrift competition after the finals. Team Falken had the least cars, but did very well. Winner of the team drift competition: “Driftteam Switzerland” represented by Michael Sahli, Florian Zimmermann, Benno Frieden, Martin Fahrni and Philippe Guillod. Philippe Guillod showed some flag for a small country in the alps. 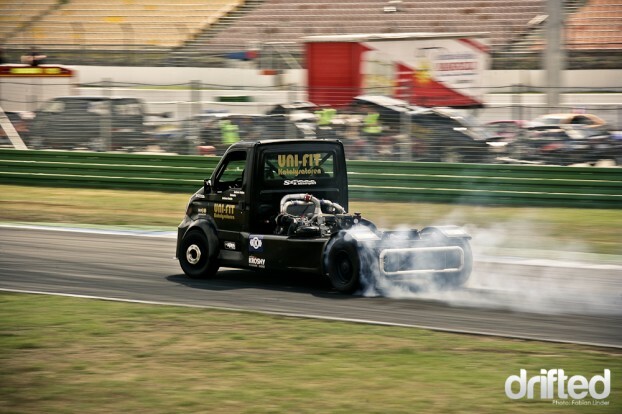 Just for show: The 1500hp Iveco wasn’t built for drifting, but does it very well! Jochen Reich showed up his Irmscher Opel Commodore which produced the best V8 sound. A great grocery getter. 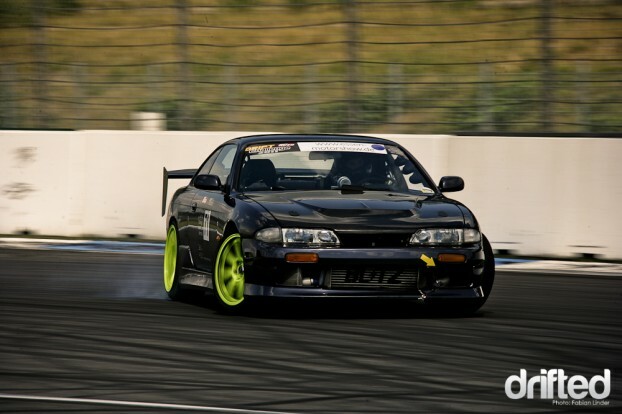 Since this year team Speed Industries member Alain Thomet has a bosozoku exhaust on his S14. Bianca Lankes takes her AMG out for a ride in the gravel. 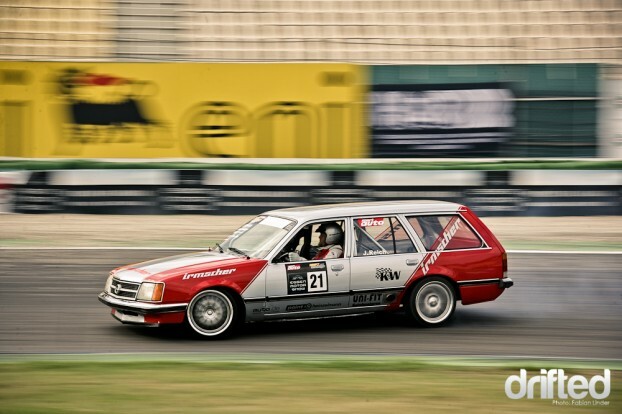 It was the only Mercedes competing, but there are some interesting Mercedes projects going on.